Clark Weber, 35-year veteran of Chicago radio, returns to the air on WIND AM560's "Aging Info Radio," Saturdays at 6:00 a.m. He provides observations and commentary in a segment called "Look at Life,"--how it was, how it's changed and the ways it's stayed the same. Chicago radio personality Clark Weber returns to the airwaves with observations about life on WIND AM560's “Aging Info Radio” Saturday mornings at 6:00 a.m.
People fear retirement as an end to their productive lives. But those fears are unfounded. Our skills are still valuable and needed. Chicago’s boomer-age fans of ‘60s rock ‘n roll radio will be transported to another time upon hearing the voice of disc jockey and talk show host Clark Weber back on the air. 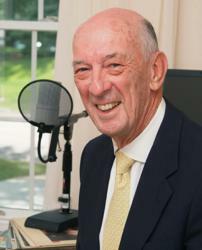 The 35-year veteran of WLS, WIND, WCFL and WJJD can now be heard every Saturday morning at 6:00 a.m. on WIND AM560. Weber offers a wry “Look at Life” on “Aging Info Radio.” He shares observations about life – how it was, how it’s changed and the ways it’s stayed the same. At 82, Weber’s voice hasn’t changed a bit. Weber comes from an era when disc jockeys were as famous as the people who made the music. Having left the airwaves in 1996, retirement has only partially caught up with “Mother Weber’s oldest son.” Though a new resident at Westminster Place retirement community in Evanston, IL, “Aging Info Radio” is just one of his gigs. Weber travels across the country speaking about aging and retirement living at other senior communities and organizations. Weber addresses other options for retirement living including choosing to age in place at home and live with relatives. He recommends removing hazards from the home that could cause falls, using the support of area senior organizations and actively seeking out opportunities for socialization. Weber and his wife Joan are longtime Evanston, IL, residents and moved to nearby Westminster Place, a Presbyterian Homes community, where they can remain close to their children, church, and first great-grandchild. In addition to the topic of aging, Weber also speaks about his recent memoir chronicling rock and roll's golden age: “Clark Weber's Rock and Roll Radio: 1955 to 1975 The Fun Years.” The book is filled with photos and “behind the scenes” anecdotes and recollections about time spent with an array of stars to include the Beatles, Diana Ross and the Supremes, Barbra Streisand and Janis Joplin. WIND AM560’s “Aging Info Radio” airs every Saturday at 6:00 a.m. and explores topics on healthy aging, elder care, boomer & senior lifestyles, aging in place, retirement wealth and related topics and guests.